To understand this tidbit lesson, please make sure you have read and understood the two lessons on the mechanism for articulation of letters (lessons 14 and 15 from the top of the archive page), located in the tidbit archive section. ( ). The medd and leen letters are produced by vibration of the vocal cords. Letters are divided into three groups when categorized according to the length of running of their sound. , meaning its [letters of] strength are in the phrase . 3. Letters of softness ( ) These letters have clear and obvious running of the sound when they are articulated without a vowel (saakinah). Examples are in the following three saakin letters that are in the category of : . Each of these three letters in the example should have a running of the sound, longer than saakin letters of the other two groups The letters of this group are all the letters remaining when taking out the letters of and . ( ). The Arabs, due to the annoyance and difficulty in pronouncing these five letters when saakinah, have violated the rule that saakinah letters are articulated by collision between the two articulating bodies of articulation, ( ). Instead, these letters are articulated by separation of the two articulating parts of articulation ( ), the same as voweled letters, but without any corresponding movement of the mouth and jaw that is associated with voweled letters. ( ) of the two parts of articulation, but unlike it since the qalqalah has no accompanying jaw and mouth movement and the voweled letter does. Its applied definition: Disturbance of the letter when it is in the state of being non-voweled until a strong accent is heard when it is articulated by parting of the two components of the articulating parts, not by collision, without accompanying it any opening of the mouth, or circling of the lips, or lowering of the jaw. A very important note: The qalqalah does not resemble a fat-h or a dhammah or a kasrah. It does not follow the vowel of the preceding letter, nor the following letter. 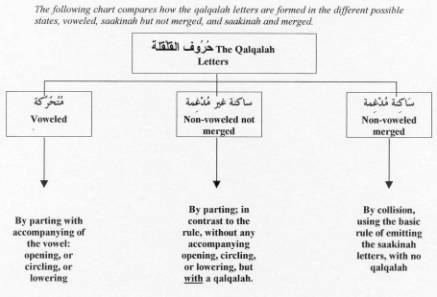 If the qalqalah letters have a shaddah indicating merging of two of the same letter ( ), the first letter of the shaddah (which is saakin) is then articulated by collision, or . For example: and . If we are stopping on the first word in the previous example, the first of the word is pronounced by collision, or , and the second is recited with a qalqalah. This means that the qalqalah is pronounced with without any accompanying mouth and jaw movement. The of the word would be the same as the in the word . The Greater Qalqalah : This happens when the qalqalah is the last letter of a word, and we are stopping on that word. For example: . The difference between the two divisions is that there is more of a ring to the greater qalqalah because we are stopping on it, than there is on the lesser qalqalah.